I grew up in the fourth biggest city in Norway, Stavanger, which has a population approximately twice that of Redlands, California. The entire country’s population is around the size of San Bernardino. 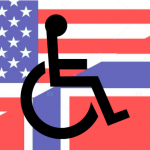 Norway is associated with democratic socialism, free healthcare, winter sports, oil, and fish. This is where I spent the first decade and a half of my life. “Why would you move here?” is something I hear a lot. In theory, Norway is the better place for someone with my condition: free healthcare, excellent social security, liberal laws, etc. And, while that is all true, it’s only half of the picture. 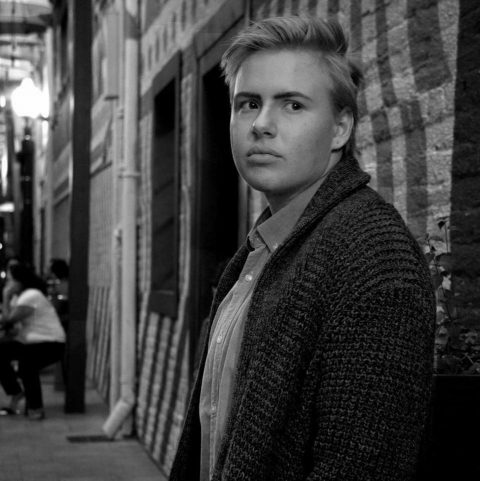 When I was 16, I moved to Redwood City, California—warm weather, excellent healthcare, diverse culture and population, friendly people, and a large LGBTQ+ population. The perfect escape from a cold and frigid Norway, and yet, it did little to ease my suffering. In May 2014, I started suffering from chronic headaches and fatigue and was diagnosed with anemia. However, being the smart cookie that I am, I decided to not take my iron supplements as they caused even worse headaches and nausea. This led to a complete iron depletion in October. My entire body stopped functioning, I was hot all the time, I couldn’t think, and I barely had enough energy to move. I was a mess. I started on the iron tablets again, and while it helped a lot with the fatigue, I started experiencing aches. First once or twice a day, then several times a day, and then non-stop. My sister recognized it as Fibromyalgia. I was diagnosed in the spring of 2016. It was a long and harrowing journey. Fibromyalgia is an old person’s disease. I’m chock-full of those. I got diagnosed with arthritis this summer at 19, and low tear production at nine. I was always too young. I often wondered if there were ways it could’ve been prevented. At my eighth birthday party, I was playing in a play-house and I suddenly I felt as though I couldn’t breathe. I was lying on my back, gasping for air. I had fits of nausea throughout my entire childhood. I got headaches frequently; it felt like tiny men doing construction inside my head. But these were things to ignore. That’s the Norwegian way—to ignore. Even when we went to the family physician, he seemed to have a hard time believing me. When my sister suspected fibromyalgia, it was dismissed. “I don’t want to diagnose you with that”. I was sent to psychiatry, and they confirmed it wasn’t psychosomatic, but he still refused to do more tests on me. There were reports of Norwegian teenagers who were put into induced comas due to paralyzing pain from over-exertion. Before my iron-depletion, I was in the rigorous International Baccalaureate (IB) Middle Years Program , choir, Model United Nations and fencing twice a week. Pain is something to be ignored. My (undiagnosed) fibromyalgia made it so I only barely graduated from Middle Years Programme (MYP ), and my mother took me to see specialists. As specialists aren’t covered in free healthcare, it cost a couple hundred dollars for each test they did. The treatments were just as limited as their knowledge. 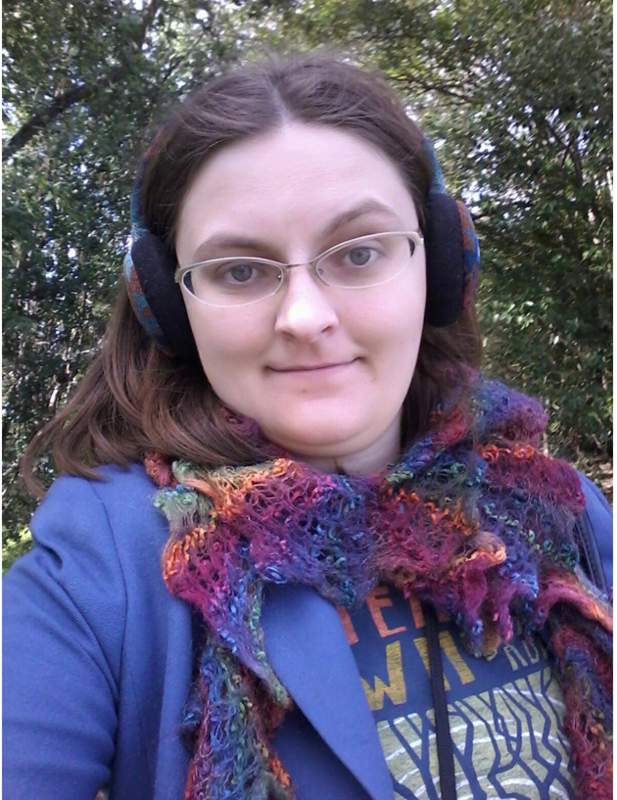 They agreed that even though it’s likely that I have fibromyalgia, the diagnosis wouldn’t help much as the treatment would be the same, either with specialists or be put on a waitlist for one to three years for treatment by public healthcare. Stavanger is one of the best places to have a heart attack. Chronic illness? Not so much. 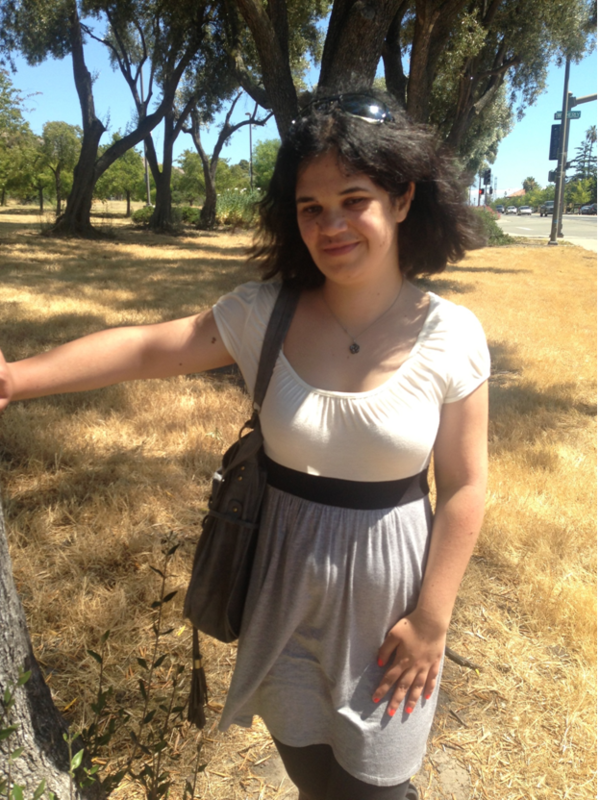 Fall 2015 I started treatment at the Pain Clinic at Stanford Medical Center. They still refused to give me a proper diagnosis, but I was being seen by a psychologist, physical therapist, psychiatrist and acupuncturist. The treatment helped, but school… was a nightmare. I was doing the same IB program at the American public high school I went to, but IB at that school was IB on top of regular school. I left the IB program within the month. I was still very ill, and the concept of doing six hours of homework every night on top of eight hours of school didn’t agree with my fibromyalgia. I asked for accommodations, but the only thing they could grant me was homework extensions and a permanent hall pass. That didn’t make much difference when I could barely get out of bed. After three months of brick and mortar, I unofficially dropped out. I transferred to an online school, but there was still a requirement of nine hours of schoolwork per day. No one had told me the American Dream translated to ‘grind until you die’. I unofficially dropped out of online school in the spring and then studied hard and tested out of high school in the fall. Just in time to move to Southern California as there was nothing left for me in the Bay Area. My sister was attending the University of Redlands and was my greatest support system at the time, and it was great to be with her again. I spent the next year in limbo, trying to figure out what I could possibly do in my current state in a country that didn’t seem to want me, from a country that didn’t seem to want to help me. I have since paved my own path and worked with people who did want me and did want to help me. I think a lot about my two cultures and how they’re ingrained in my DNA and psyche, as much as I try to withdraw from them. I take no pride in them, but I have great interest in them—in how they shaped me, and how they treated me, and people like me. How they helped me and how they hurt me; how my experiences are unique and how they are universal. Under the direction of the Youth Organizer the YO! Volunteer will engage in youth organizing campaigns, promote the YO! 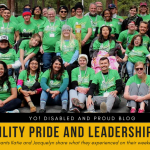 Disabled and Proud program. 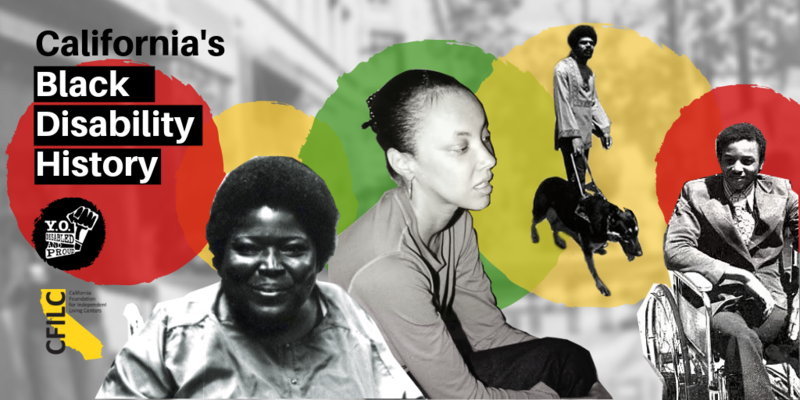 Assist in organizing of activities related to CFILC’s Youth Organizing! 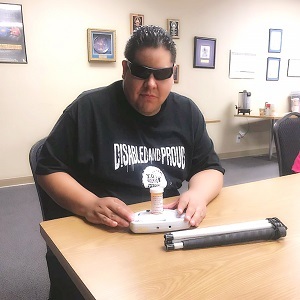 Disabled & Proud program. Assist in organizing events that are youth led and youth driven, such as summits, community forums, trainings and leadership events. Assist in collecting youth input for projects and campaigns. Assist in developing website materials and social media content. Bolster social network presence for youth organizing activities within your local community. Assist in maintaining the local social network for youth. Assist in answering the YO! 411 Hotline. Other emerging volunteer assignments as needed. Youth with a disability between the ages of 16 -28. Ability to communicate with other youth and adults with disabilities. Ability to ask for assistance and support when needed. Ability to research, plan and provide information to youth about local resources and events. Ability to operate in a computer-based office environment. Ability to commitment 16 hours minimum per month for one year. 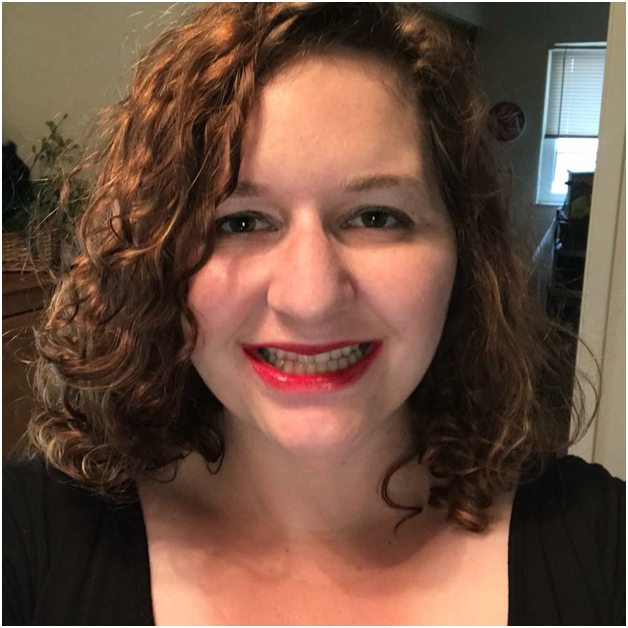 I may have started using assistive technology (AT) in junior high, but my ‘relationship’ with technology did not start until I got to my first year of college. Throughout my junior high and high school years, I used my BrailleNote to do almost all my homework. A BrailleNote is device that is similar to an iPad in size but thicker. It has 13 buttons and it kind of works like a laptop because it has internet and email. The only subject I didn’t use my BrailleNote to do my homework was math. I used to do my math work on a Brailler. A Brailler is a huge machine that has ten keys and once you put a piece of paper in you could start writing Braille. For those that have seen or heard of a Brailler, will know what a pain those machines are. I was never taught or told how to do math on the BrailleNote. I didn’t even know how to use a computer. Find Braille Display Note-taker devices like these one the Ability Tools AT Exchange, free of charge to borrow! During my first year of college, I did not know how I was going to do my homework because the college didn’t have any Braillers. I needed to figure out a way to do my math work, so I began to research for ways that blind people can do math without using a Brailler. After a couple of days of searching, I found helpful information on how to do math on the BrailleNote. I took that situation as a wake up call and I started to search for all the technology available for me. I also started taking classes to learn more about computers and all the different screen readers. All my work paid off because I was able to successfully pass my math class. Since that event in my life, I have gotten involved with technology and I try to stay on top of it. 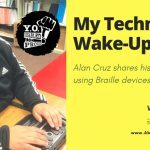 I enjoy connecting youth to technology because I don’t want them to go through the same struggles as I did. I want them to know as much as possible about technology so they can be prepared and successful when they go to college. In addition, I provide my students and consumers with as many resources as possible. It is very important to me because I want them to be successful in school and work. I feel that their future depends on what I teach them and also on the resources that I connect them to. Technology is not going away, so I recommend that youth and adults learn as much as possible. It does not hurt any one to know about computers, cell phones, and other software. It would definitely look wonderful in those resumes. Check out talking prescription dispensers and more reader devices (available for free to borrow!) on the AT Exchange. Jose (Alan) Cruz lives in Southern California and is transitioning from being a Youth Organizing (YO!) Disabled and Proud volunteer to working at the Dayle McIntosh Center (DMC) in Anaheim. He has been blind since the age of four. You can see Alan working (and having fun!) with the DMC youth group via Facebook and Instagram. Under the direction of the Communications and Marketing Manager and Youth Organizer the YO! 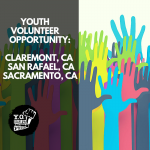 Volunteer will engage in youth organizing campaigns, promote the YO! Disabled and Proud program, and other CFILC promotional activities. Volunteers for this opportunity must be able to travel to Downtown Sacramento. Doctor appointments, blood tests, needles, MRI scans,.. If you have a chronic illness like me, you know the drill. Does your heart start pounding from the moment you enter the waiting room? Do you have sweaty palms? Do you try to minimize your symptoms to your doctor because you are afraid of their judgement? Do you freeze up when they question your health issues? Do you think of all the things you should have said on the way home? Does this sound familiar? It is all too familiar to me! You could say I have a lot of experience when it comes to doctor appointments. I have had chronic health issues ever since I was nine years old. It took me ten years and a good amount of doctors before I finally received my diagnosis. I still feel anxious every time I have to see a doctor for new symptoms. And let’s face it, no one ever came home saying they had a blast at the doctors. There is no “cure” for anxiety, but I thought I’d share my tips and tricks to make it more manageable with you. I think this one seems pretty obvious. However, I know that I always manage to forget to say at least one thing during an appointment. Whether it is asking for a prescription or explaining a new symptom I have been experiencing, something always slips my mind. When there is a lot to remember, make a list of things you need to talk about. At the end of the day, doctor appointments cost us money and time so it’s better to prevent ourselves from having to make another appointment. The last time I saw my General Practitioner (GP), I wanted to hear her opinion on a word I could not pronounce. Instead of worrying if I could say it the right way, I just wrote it down and showed it to her. I’m lucky my mom has always come with me to doctor appointments. It’s a comforting feeling to know you don’t have to do this by yourself. I know this is not a possibility for everyone, but try to tell someone that you’re going. Explain what’s wrong to them and what answers you hope to get. It can be as simple as texting a friend. Sharing your experience with someone makes it less scary. I personally struggle with chronic fatigue and sometimes when I’m really unwell, it’s hard to explain everything properly and react when I don’t agree with something that the doctor is saying. When this happens, my mom will notice right away and stand up for me when I can’t. Whenever I have to do something that scares me or is hard, I reward myself afterwards for my courage. When I was little and went to the hospital for tests, my mom and I stopped at McDonalds for a shake or ended the day on a good note by going shopping. Now that I have my diagnoses, I thankfully don’t have to go to as many appointments as back then, but I always like to have something to look forward to. Save that new episode of your favorite Netflix show until you get home after the appointment or take a long bubble bath. I hope this helped you in some way and that you’re doing okay. 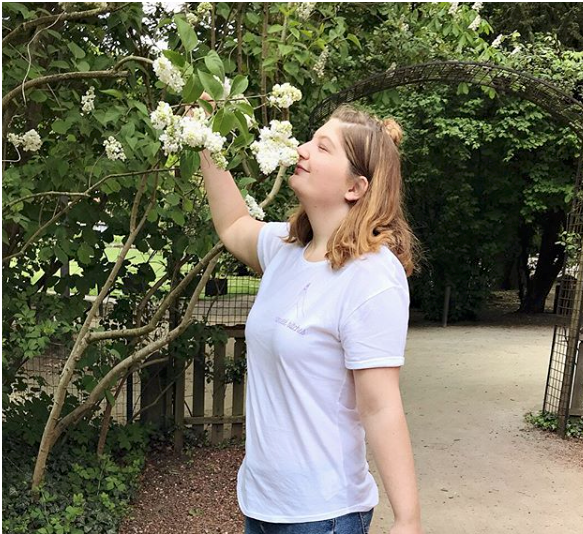 A young white woman in a white shirt smelling a flower that is hanging above her. By clicking on links to other websites you understand that the thoughts and opinions expressed of most websites are not that of CFILC or any of its partner programs. 1.Why did you originally get involved with YO? I became involved with YO! to gain experience in a field that I will always enjoy, disability rights advocacy. What did you gain from being a part of YO? I have gained experience and friends in an open-minded environment that has helped lead me to my current paid work experience with the state. Yes, and in fact, I like to think that I am still doing YO! volunteering in an informal way, such as speaking with schools on disability issues or recruiting potential new members. No matter how busy I am with my paid work, I will always make time for the things I am passionate about. A friend told me that once I am a volunteer here, I am always a volunteer here. Would you refer or recommend a youth to be a part of YO? Yes, and I look forward to seeing what a friend of my family has to offer YO! once she is at the age when she can begin volunteering. The best part was the people whom I got to work alongside with. I still stay in touch with many friends I have made along the way, and connect to new and old volunteers whom I may not have even met in person. I describe YO! as being a program that offers young disabled adults/teens a career-like setting where they can discuss a number of topics on disability advocacy. They can also develop workplace skills in a safe environment, such as making phone calls, tabling events, and professional journaling. What have you accomplished since you completed your YO! 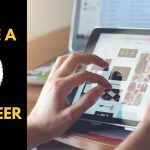 Volunteer time or time on the YAC? Since completing my time on the YAC, I have put my focus to getting my first state job. I have landed an office position job in the Workers Compensation office at the Sonoma Developmental Center. I originally got involved with YO! 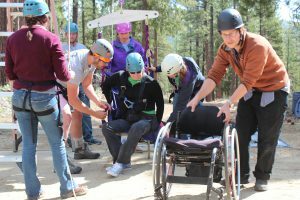 because I heard about how fun it was and how it was a way to connect with other youth with disabilities in the community. From being a part of YO!, I gained leadership skills and learned how to be autonomous. I learned to make sure timesheets were done on time, attended conference calls when needed and stayed up to date with tasks. Yes, I would. I really like the way YO! encourages people with disabilities to work hard at the projects they are given in their ILCs and at YO!. The calls would help us understand what we need to work on in our ILCs – not everyone in their ILC works on the same things so it was interesting to share stories this way. Would you refer or recommend a youth to YO!? What was the best part of being a YO! Volunteer or YAC member? The best part of being a YO! Volunteer was definitely being part of a community/team and also having a flexible remote schedule. I think it can be tough if you are not local since you miss out on social interaction and the daily office life. I did get to see the new YO! office last year so it was a great way to bring back memories. YO! is a great place where you will meet people close to your age who have disabilities. Usually there are opportunities where you can work together at booths for resource fairs and discuss current events such as at conferences or on telephone calls. YO! is about teamwork, but there will be chances for working independently to boost confidence. What have you accomplished since you completed your Volunteer time with YO! or time on the YAC? Since I have completed my volunteer time with YO!, I have become more used to being autonomous (trying my best to get things done independently). I have become more confident as a person since I am generally shy, and also have become more diligent about deadlines. 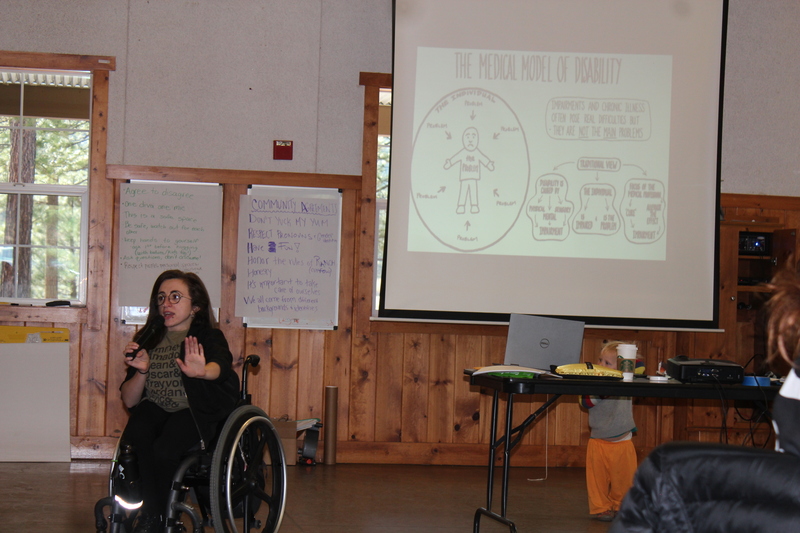 At Grizzly Creek Ranch (GCR) in Portola, CA we had a statewide summit for Disability Pride and Leadership. 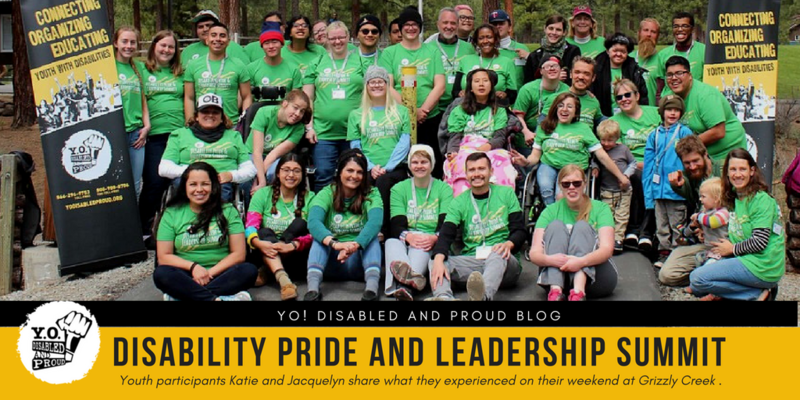 The purpose of the summit was to bring together youth with disabilities from across California to start making a campaign for Disability Pride Month in July.